Are you ready for another assignment? Understand these are not directives or orders - just a opportunity to apply some of which you're learning here and on my other blog Benevolent Magic. There are opportunities now to help animals and I think that some of you would like to do this. Consider what kind of animals live around where you live. These can be pets, they can be free - meaning they are living on their own in their own groups. They can be water creatures, they can be winged ones, they can be any form of animals but not in this case human beings. Let's work with animals first. I'd like you to consider that many animals feel crowded, you know that, because there are more human beings here on Earth than there have been for a long time. So it is possible to do something to help them. I'd like to recommend that you visualize this planet being about two and a half times its now size. What this means essentially is that the spaces between things would be larger. If your house say, is 40 feet from your neighbors house it would be just that much farther from your neighbors house and like that. There would be more room. Do this with the animals in mind. Actually consider - look around your neighborhood or the land upon which your community sits - imagine things being farther apart because there is space. This is something that can also be done aided by true magic. You don't have to do it but if you want to this is how. Ask for all the benevolent energies that are available to you to be all around and about you before you begin and then try to go outside at night when there's lots of stars out and glance up in the sky and the first star you happen to see - that's the one to use. Then glance down at your left foot on the ground, then at your right foot on the ground. Then say these words, "I am asking that the stars in the sky and that my touching the ground be the manner and means to expand the space on this planet - that this planet have more land, more water and more mass and that that happens in the most benevolent, easy and comfortable way for all beings and that the result will be that everyone will have more space to live in." You might feel that this is some kind of wishful thinking but if enough people do this you will find that not only will there be more land, more water, more of what everyone needs but for no reason that can be explained the Earth will just be bigger. It will happen without anybody noticing and when it happens people will believe that it has always been that way. You see, that's the best kind of magic that harms no one and that everyone takes for granted when it is experienced. Always remember that. There is a chance now, for those of us who wish to participate, to bring about a greater balance and co-ordination of all our human skills. We admire athletes when they achieve great accomplishments and we also admire those who have gone on in life to solve difficult problems. Equally we often admire the very young for their joy and pleasure in discovering the world but what happens to us in those in-between years when life is just a struggle? How can we find a way to feel more comfortable in our physical bodies in our physical worlds when life just seems to be one confusion and doubt after another? This is what I do and I recommend it to you. I have often found an old tree - one that sometimes looks kind of rugged but has been there for a long time - not a young tree but an old tree. Often one finds these in parks and if not, if there is no such thing near you, then here's an alternative. Perhaps it might be a mountain at a distance or if you live near the water, the sea at a distance. A little over the horizon or at least at the horizon line where there are no ships might do in a pinch but I'm going to use a tree for an example today. Look above the top of the tree, not at the tree itself. You can if you prefer look at the base of the tree, then let your gaze travel up the trunk into the branches and then the top of the tree. Concentrate your gaze about 5 or 6 feet above the top of the tree. Some of you might see the auric field or the light body - that's alright if you see that. If you don't it's also alright. Try to make sure that the way you are looking, above the top of the tree, does not cause any buildings to be in the background or anything human created if you can possibly help it. Then while you're looking at that place, essentially in space, above the top of the tree just breathe naturally. Breathe in and out for 3, 4 - up to 10 breathes and then relax. Trees have a great capacity for bringing about, for themselves and with their interaction with Earth and the energies here, transformation that helps and eases our way. For those of you who live in mountain communities - perhaps desert-like mountains where no trees are nearby, then look at the top of any mountain and just look a little above it. Again you might see a light energy radiating from it. If you do just focus there and breathe in and out the same way. You can do the same thing with the sea at a distance if that's all that you have available in the natural world. Again, try to make sure there are no ships there and breathe in and out. It will help you to not only feel more relaxed but it reminds your physical body of its natural state and it will also help you, possibly, to let go of the demands of whatever the people around you seem to expect of you. Just remember, you are a natural being and you are doing the best you can to cope with your world, to cope with your life. If things are difficult do this once a day and get into the habit of it. It may be of some comfort. There's a place, not difficult to find, in the hearts of all human beings. I'm going to instruct you how to find it now. Take your 3 long fingers of your left hand and place them, just the finger tips, over your heart. Then pressing the finger tip that's the lowest, then the next lowest, then the highest. Repeat that pattern 3 times - pressing slightly, then pressing the next one slightly and so on and do that pattern three times. This will activate that area in your heart. What this does is to connect you as an individual to that portion of yourself that is beyond this realm. The advantage is that that portion of you will be able to communicate with you more directly now in your dreams. So this is how to use that skill. Ask out loud, before you go to sleep, a question stated as simply as possible about your life. You must say it out loud. It would be best if no one else could hear you so you can whisper it if you like as long as the sound is audible. 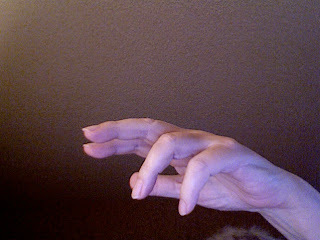 Then do that gesture one more time and then you may go to sleep or otherwise engage yourself before you go to sleep. There is a good chance, at least one in three, that if you do this you will get an answer in your dream though I cannot guarantee you will recall it when you wake up. It will as always come through symbolically in the dream state. So this is how you will know if it's accurate. If it is something benevolent - meaning positive - good for you and good for others - it is most likely the answer because that other portion of you can only give things that are benevolent - meaning good for you and good for others. If it is harsh - harmful to you or harmful to others - it will not be from that source. And that is how you will know it is accurate. I recommend you try this. I cannot guarantee it will work but for some of you it might be helpful. Now I would like to offer a final suggestion here. For those of you who've been following these blogs for a time you know that I've been talking about true magic from time to time and if you'd like to participate I want to welcome you. True magic must be done with absolute respect for all life, not just as a thought but as an application. Try to find various places on the land that you can do these things. 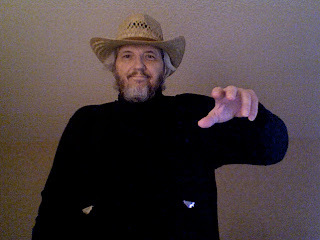 Try to do it initially on your own or with a friend who would like to participate but if they're participating I strongly recommend that they've read these blogs - at least Benevolent Magic and Mystical Man to get a background and to have done some of the homework at least would be most helpful for it's not just the performing of the true magic that's involved here - it's an attitude of service. I know that most of you who are reading this completely understand that and embrace it but for those of you who are new to this and new to these blogs that I'm putting out here it's important to remember that. This is not a dogma, it is simply a teaching and I expect you to add your own teaching when you feel inclined to share things with others. I am not suggesting that you think of it as - to be taken word for word. This teaching on these blogs are meant for our times and they are meant to be modified in the most benevolent way for your times to come. I have faith in your ability to do so. Now I want to suggest that you find a few places on the land where you can do this on a regular basis if you are so inclined as I will give more true magic as time goes on. I've given a few of these things already here and also here. This is how to approach the one we're working on now. Find a spot on the land where you can feel comfortable and safe and if you want or need to have someone to look after you at a distance that's fine but they must be at least 50 feet away from you. Try to have no other human beings around. So mothers, if you have children try to have them at a distance. It's because the work is so strong. We don't want to deflect them from their own pathways, as children are very open and receptive - you understand. The best time to do this is at night when the stars are out. This is what I recommend. If you live in the northern hemisphere then seek out either Orion as a star system or the Pleiades. If you live in the southern hemisphere, the Southern Cross as a star grouping would be fine but if you do not have visuals with such star systems almost any star will do - only however if you have a good feeling for it. This is what to do. Go out on the land and stand in a way that you're facing the north if you're in the northern hemisphere or facing the south if you're in the southern hemisphere and doing that place your feet about one and a half feet or even two feet, as a measurement, apart from each other. Then place your left foot about 2 feet or so forward and your right foot, using the clock as a diagram, at about 2 o'clock - meaning that position. Your left foot is simply straight ahead from your body. Aim your left arm down towards the ground with your palm aimed towards your body and put your right arm out - straight out from the side of your body with a slight bend in your arm so that you are essentially holding your arm straight out from the side of your body and your arm bent in such a way as it would be considered a right angle - okay - you understand. Put your right hand in the wand position. Then look up at the star grouping that you have picked. Then look down at the ground below you and say the following words, "I am asking that all beings on the Earth receive the respect, honoring, love and appreciation they need and we need to provide them so that the equalization of all species in harmony can proceed now in the most benevolent way." After you have said that try to hold the position for another 10 seconds to 15 seconds and then relax. After you have relaxed your position and are standing in some way that is comfortable to you turn to your left even if you need to go to your right. Simply turn to your left remaining in the general area, within 2 feet at least, of where you were standing and go to where you need to go. If you have to go to your left then simply do that. If you have to go some other direction turn to your left so you are facing that direction and walk away from that spot on the land slowly. Don't, if you would, be upset if other people walk in that spot but the advantage of doing this at night is that there may be less foot traffic wherever you are. Find some spot that is safe - alright. That's most important. I want you all to be safe but also know that this is a contribution. I am not requiring you to do any of these things. This is a suggestion for those of you who wish to participate only. If you want to be involved in true magic and influencing the world in a benevolent way I will provide more of these things in time.